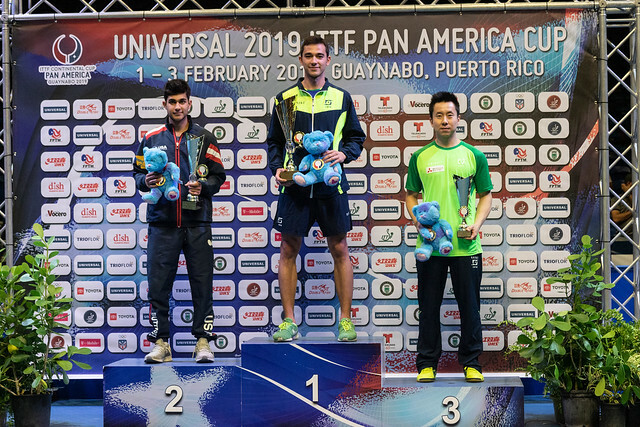 A first appearance, it could not have been a better start for Nikhil Kumar of the United States; in his opening match at the Universal 2019 Pan America Cup he escaped from the jaws of defeat to record a sensational opening men’s singles win. The no.15 seed, he beat Mexico’s Marcos Madrid, the no.5 seed and highest ranked player in the group stage of proceedings in a seven games contest (7-11, 11-8, 11-8, 9-11, 6-11, 14-12, 11-6) that tested the nerves, the nerves of coach Jörg Bitzigeo! Only 16 years, born on Wednesday 1st January 2003 and thus has three years left in the junior ranks, the talented left hander from San José in California, saved two match points in the sixth game of the contest against the more experienced Mexican before assuming control in the decider. The feature of his play, his control, as they say in the trade, good hands. Defeat for Marcos Madrid, there was also a scare for Ecuador’s Alberto Miño, the no.6 seed; he had to recover from a two games to nil deficit to beat Guatemala’s Allan Guttierez (9-11, 9-11, 11-8, 11-4, 11-8, 11-2). Testing times for the leading names in the opening matches in the group phase of the men’s event as play commenced in Guaynabo; it was very different for the ladies, the one common factor being more success for the United States. Lily Zhang, the no.5 seed, beat Chile’s Judith Morales, the no.13 seed (11-3, 11-6, 11-3, 11-7); she was followed by Brazil’s Gui Lin, the no.6 seed, who accounted for Guatemala’s Lucia Cordero, the no.15 seed (11-4, 11-9, 5-11, 11-8, 11-4).